Borax is commonly found in stores as a “laundry booster” for under $5. But did you know that you can use borax to kill roaches too? Not only does it clean your clothes in the washer, it also “cleans” your house of nasty pests like cockroaches and ants. Find out where you can get your hands on some, how to handle it properly and how to use it effectively to get rid of roaches in your house. Borax is also called sodium borate. It is a naturally occurring mineral that can often be found in dry lake beds and other natural deposit sites. People have been using it for various purposes including soap and detergent since before the 1900s. The borax you’ll typically find for sale is a white powder. It will most likely be labeled as a laundry booster, or detergent of some sort. They can be found among the laundry detergents in the appropriate aisle. According to Wikipedia, it was once briefly registered as an insecticide, but was removed after a year. I’m not sure how accurate that is and if you’ll be able to find it sold as a pesticide. I’ve always just bought the 20 Mule Brand laundry boosters. If you’re intent on finding the pesticide stuff, just check the label for the active ingredient. It should be something like sodium borate, borax, sodium tetra borate, or disodium tetra borate. There really isn’t any plausible reason to buy borax labeled as an insecticide though. You would be paying twice the price for the same stuff. Stick to the laundry label and save your time and money. Check your local grocery stores, super stores and home improvement stores to buy it. 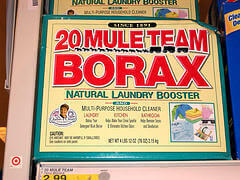 In the United States, the most notable brand selling borax as a laundry booster is 20 Mule Team. As of this writing, it comes in a rectangle shaped box. If, for some unexplainable reason, you are unable to find any at your local stores then you can get it online. Amazon has a wide selection available at reasonable prices. I highly recommend you read the warning labels and the instructions printed on the product packaging. You’ll find the usual warnings about not getting it in your eyes and not to ingest it, etc. Borax isn’t very toxic to humans in small amounts, but let’s use a little common sense here and avoid harm to ourselves and others. Sufficient exposure can cause symptoms including irritation and headaches. Avoid getting it into food and drinks. Always keep it out of reach of children and pets. The most practical way to use borax to get rid of roaches is to lightly dust areas where you see high roach traffic. You don’t want a thick layer because they’ll just walk around it. The best way to get perfect results every time is to use a duster like this one. When they walk over these lightly dusted areas, the powder will stick on to their legs and body. They will eventually get to cleaning themselves by licking and eating the borax stuck to them. Once ingested, it kills them. Often enough, a roach that dies from borax still has more stuck onto it. Other roaches will feast on those them and get poisoned as well. It works out great for you when they return to their nest and die there. One dead roach kills another dozen or more. This isn’t an instant results treatment. It will take some time. You should see the population drop after a month. The roaches you see if get smaller and smaller as the larger adults die off. Keep at it for another month even after you stop seeing them. Make sure you keep the house clean and consider combining it with another treatment for better results. Using borax to kill roaches is as simple as that. The hard part is consistency and patience.